The McDonnell Douglas (now Boeing) AV-8B is a ground-attack aircraft that constitutes the second generation of the Harrier aircraft family. Capable of vertical or short takeoff and landing, the aircraft was designed in the 1980s as an Anglo-American development of the British Hawker Siddeley Harrier, the first operational V/STOL aircraft. It is primarily employed on light attack or multi-role missions, ranging from close air support in support ground troops to armed reconnaissance. The AV-8B is used by the United States Marine Corps(USMC), the Spanish Navy and the Italian Navy. A variant of the AV-8B, the British Aerospace Harrier II was developed for the British military, while another, the TAV-8B, is a dedicated two-seat trainer. The Harrier II and other models of the Harrier family have been called "Jump Jets". The AV-8B was extensively redesigned by McDonnell Douglas from the earlier AV-8A/C Harrier. While retaining the general layout of its predecessor, the aircraft incorporates a new wing, an elevated cockpit, a redesigned fuselage, one extra hardpoint per wing, and other structural and aerodynamic refinements. The aircraft is powered by an upgraded version of the Rolls Royce Pegasus, which gives the aircraft its remarkable V/STOL ability. 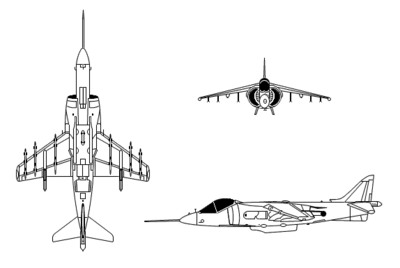 Later upgrades added the radar and a night-attack capability, resulting in the AV-8B(NA) and AV-8B Harrier II Plus, respectively. British Aerospace joined the improved Harrier project as partner in 1981, giving it a significant work-share in the project. Since corporate mergers in the 1990s, Boeing and BAE Systems have jointly supported the program. Typically operated from small aircraft carriers, large amphibious assault ships and simple forward operating bases, AV-8Bs have participated in numerous conflicts, proving themselves versatile assets. US Army General Norman Schwarzkopf named the USMC Harrier as one of the seven most important weapons of the Gulf War. The aircraft took part in combat during the Iraq War beginning in 2003. The Harrier II has served in Operation Enduring Freedom in Afghanistan since 2001, and was used in Operation Odyssey Dawn in Libya in 2011. Italian and Spanish Harrier IIs participated in overseas conflicts in conjunction with NATO coalitions. American and Italian AV-8Bs are expected to be replaced by the Lockheed Martin F-35B Lightning II. The USMC is expected to operate its Harriers until 2030. The AV-8B Harrier II is a subsonic attack aircraft. It retains the basic layout of the Hawker Siddeley Harrier, with horizontal stabilizers and shoulder-mounted wings featuring prominent anhedral (downward slope). The aircraft is powered by a single Rolls-Royce Pegasus turbofan engine; the Pegasus's two intakes and four synchronized vectorable nozzles are located close to the turbine; two nozzles are near the forward, cold end of the engine and two nozzles are near the rear, hot end of the engine. This arrangement contrasts with most fixed-wing aircraft, which have their engine nozzles at the rear. The Harrier II also has smaller valve-controlled nozzles in the nose, tail and wingtips to provide control at low airspeeds. The AV-8B is equipped with one centerline (located below the fuselage) and six wing hardpoints (up from five in total on the Hawker Siddeley Harrier) for carrying weapons and external fuel tanks, along with two fuselage stations for a 25 mm GAU-12 cannon and ammunition pack. The British Aerospace Harrier II, a variant tailored to the RAF, uses different avionics, and has one additional missile pylon on each wing. The Harrier II retains the tandem undercarriage layout of the first-generation Harriers, although the outriggers (mechanisms with wheels that keep the aircraft upright) were moved from the wingtip to mid-span for a tighter turning radius when taxiing. The engine intakes are bigger than those of the first-generation Harrier, and have a revised inlet. Underneath the fuselage centerline McDonnell Douglas added lift-improvement devices, which capture the reflected engine exhaust, equivalent to 1,200 lb (544 kg) of lift. The aircraft incorporates numerous structural and aerodynamic changes. MDC engineers designed a new, longer one-piece supercritical wing, which improves cruise performance by delaying the rise in drag and increasing lift-to-drag ratio. Made of carbon-fiber composites, the wing is thicker, has a larger aspect ratio, reduced sweep, and an area increased to 230 square feet (21.40 m2). The lighter wing has a high-lift configuration, employing flaps that automatically deploy during aircraft maneuvers, and drooped ailerons. The wing, when used in concert with leading-edge root extension (LERX, which are extensions to the root of the wing's leading-edge), allows for a 6,700-pound (3,035 kg) increase in payload compared with the first-generation Harriers after a 1,000 ft (300 m) takeoff roll. The Harrier II was the first combat aircraft to employ composite materials extensively; they are used on the wings, rudder, flaps, nose, forward fuselage and empennage. In total, 26 percent of the aircraft's structure is made of composites, reducing the weight of the aircraft by 480 lb (217 kg) compared with a conventional metal structure. The technological advances incorporated into the Harrier II, compared with the original Harrier, significantly reduce the workload on the pilot. The supercritical wing, hands-on-throttle-and-stick (HOTAS) control principle, and deliberately engineered lateral stability make the aircraft fundamentally easier to fly. Ed Harper, general manager for the McDonnell Douglas Harrier II development program, summarized: "The AV-8B looks a lot like the original Harrier and it uses the same operating fundamentals. It just uses them a lot better". The cockpit was elevated to give the pilot an improved all-round view. A large cathode-ray tube multi-purpose display, taken from the F/A-18 Hornet, makes up much of the instrument panel. It has a wide range of functions, including radar warning information and weapon delivery checklist. The pilots sit on UPC/Stencel 10B zero-zero ejection seats, meaning that they are able to eject in a stationary aircraft at zero altitude, unlike earlier ejection seats that required the aircraft to move forward at a particular height for them to work. The first AV-8B Harrier IIs were commonly known as the "Day Attack" variant. Most of these were upgraded to Night Attack Harrier or Harrier II Plus standards, with the remainder being withdrawn from service. The AV-8B cockpit was also used for the early trialling of Direct Voice Input (DVI), which allows the pilot to use voice commands to issue instructions to the aircraft, using a system developed by Smiths Aerospace. The main attack avionics system was the nose-mounted Hughes AN/ASB-19. The trainer version of the AV-8B is the TAV-8B, seating two pilots in tandem. Among other changes, the forward fuselage features a 3 ft 11 in (1.19 m) extension to accommodate the second cockpit. To compensate for the slight loss of directional stability, the vertical stabilizer's area was enlarged through increases in chord (length of the wing's root) and height. USMC TAV-8Bs feature the AV-8B's digital cockpit and new systems, but have only two hardpoints and are not combat capable. Initial TAV-8Bs were powered by a 21,450-pound force (95.4 kN) F402-RR-406A engine, while later examples were fitted with the 23,000-pound force (105.8 kN) F402-RR-408A. Fielded in 1991, the Night Attack Harrier was the first upgrade of the AV-8B. It was different from the Harrier II in having a forward looking infrared (FLIR) camera added on top of the nose cone, a wide Smiths Industries head-up display (HUD), provisions for night vision goggles, and a Honeywell digital moving map system. The FLIR uses thermal imaging to identify objects by their heat signatures. The engine of the AV-8B was improved for the new development; the F402-RR-408 engine was more powerful and reliable, and featured an electronic control system. The flare and chaff dispensers were moved, and the ram air intake was lengthened at the fin's base. Initially known as the AV-8D, the night-attack variant was designated the AV-8B(NA). The Harrier II Plus is very similar to the Night Attack variant, with the addition of an APG-65 pulse-doppler multi-mode radar in an extended nose, making it capable of operating advanced beyond-visual-range missiles such as the AIM-120 AMRAAM. To make additional space for the radar, the angle-rate bombing system was removed. The radars used were taken from early F/A-18 Hornets, which had been upgraded with the related APG-73. In addition to the AIM-120, the AV-8B Plus can also carry Harpoon and AGM-65 Maverick missiles. According to aviation author Lon Nordeen, the changes made "had a slight increase in drag and a bit of additional weight, but there really was not much difference in performance between the [–408-powered] Night Attack and radar Harrier II Plus aircraft." Intrepid Tiger II electronic jammer.